In September of 1990, I had the good fortune to travel with a delegation of American film/video makers, critics, and scholars to Riga, Latvia, where we met with a corresponding delegation from various film centers in the already-crumbling Soviet Union, for a week of screenings, papers, lectures, and discussions. The focus of the meeting (jointly sponsored by International Film Seminars, the organization responsible for the annual Robert Flaherty Seminar; the Latvian Cinematographers Union; the Union of Cinematographers of the Soviet Union; and the American-Soviet Film Initiative in Moscow) was "The Legacy of Vertov and Flaherty in Soviet and American Documentary." It was clear from the films presented by both delegations, however, that for this event, "documentary" had been defined broadly enough to include a wide range of approaches, including some that, at least in the West, would be considered part of the history of avant-garde filmmaking. The Riga event revealed at least one notable irony: the younger Americans tended to admire the formal inventiveness and political commitment of Vertov and to see Flaherty as comparatively reactionary, while the "Soviets" tended to see Vertov as a puppet of the now-discredited Communist regime and to admire Flaherty's individualistic spirit (see Patricia Zimmermann, "Strange Bedfellows: The Legacy of Vertov and Flaherty," Journal of Film and Video 44, nos. 1-2 [Spring/Summer 1992], a special issue devoted to the Riga event). And for me, there was one major surprise: that recent "Soviet" filmmakers, working in 35mm in established Soviet film studios, had produced a number of films that, in the United States, could only have been produced by avant-garde filmmakers working in 16mm outside the industry. I was particularly impressed with the films of Victor Kosakovsky (who presented his 1989 film, Losev), Andrei Zagdansky (who presented Interpretation of Dreams, also completed in 1989), and Artavazd Peleshian, who did not attend the Riga meeting, but whose films, My (We, 1969) and Vremena Goda (The Seasons, 1975) were presented, inspiring a demand by the American delegation for a special trip to the main television station in Riga, where a print of a third Peleshian film, Nash Vek (Our Age [now in two versions], 1982, 1990) was available. From a Western vantage point, all three filmmakers provide critical alternatives to the montage school of Soviet editing, which continues to dominate Western thinking about Russian and Soviet cinema. In Losev, Kosakovsky uses extended, rigidly composed, meditative shots to honor the persistence of the Russian Orthodox theologian Losev, who was ordained just before the October Revolution and was able to maintain his faith and integrity through seven decades, until the regime collapsed. In Interpretation of Dreams Zagdansky recycles archival imagery to create a skeletal history of Russia and the Soviet Union from the time of the czars until the collapse of the communist regime, accompanied by readings from Freud. 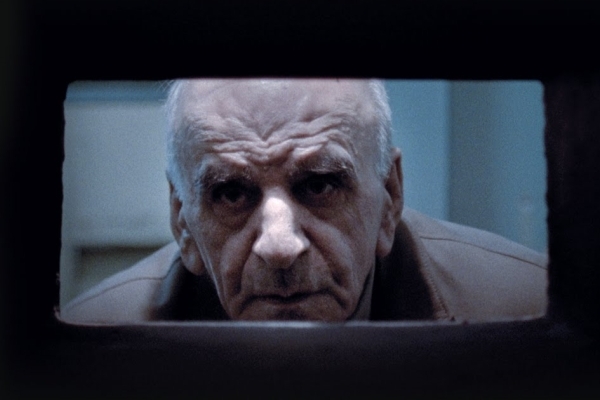 While both Kosakovsky and Zagdansky use editing strategies very different from those of Eisenstein or Vertov in order to chronicle the demise of the world that dialectic materialism, and dialectic montage, had helped to construct, the editing of Peleshian's films is in the montage tradition, though he defines his approach as "distance montage," in contradistinction to the collision montage polemicized by Eisenstein. Peleshian arranges individual shots and sound bites so that while no narrative or polemical continuity is immediately apparent, an overall vision gradually evolves. Images and sounds are repeated, always in new contexts, until the entirety of Peleshian's sense of a subject—whether it's the day-to-day life of farmers and herdsmen in his native Armenia (The Seasons) or the global fascination with the exploration of space by Soviets and Americans (Our Age)—can be comprehended. Peleshian's films are simultaneously visions of human societies and personal expressions. Our Age, for example, is about "our age" of space exploration—and I know of no film that more powerfully communicates the excitement and the terror of sitting in a tiny capsule as mega-thrust lifts a rocket into space—and about human "age." Peleshian turned 50 as he was making Our Age and embeds within the film his sense that as we grow older and come to grips with age's relentless "countdown," we desire to "blast off," whether it's in space travel, which allows us to rise above our national identities and see the Earth in all its global expanse and limitation, or in our individual struggles to transcend our limits and our particular historical moment. I was able to speak to Peleshian (with the assistance of translator Elena Dubrovsky) when Richard Herskowitz arranged for him to visit Cornell Cinema in Ithaca, New York, in June of 1991. The edited transcript was sent to Peleshian, whose corrections were translated into French by Marc Nichanian, and subsequently into English by my colleague at Utica College, Marie-Noëlle Little. Scott MacDonald: I notice from your biography that you did appliance design before you went into filmmaking. What got you interested in making films? Artavazd Peleshian: I was a draftsman and an artist and I liked film very much. I felt that what I wanted to say could be best expressed in film. Did you see a lot of film when you were young? Yes. In Russia people go to the movies a lot. I didn't see them until I entered the film institute in Moscow. Nachalo [The Beginning, 1967] is the earliest film you show now, but I noticed in your filmography that there is also a film entitled Gornyi Patrul [Mountain Vigil, 1964] and another called Zemlya Ludei [Country of Human Beings, 1966]. What kinds of films were they? Mountain Vigil was my first film. I made it when I went back to my hometown on vacation. The institute proposed that I do this project and they gave me a theme. In Armenia there's this unusual job: people sit on the mountains and their duty is to see that rocks don't fall onto the train tracks. They maintain the safe passage of the train. The film is about these people. I took this theme and translated it into my own visual language. I made a decision that if this film didn't work, I wouldn't continue at the institute. But it was a success. At the student festival I received a prize. During my second year I made the film The Country of Human Beings, in Moscow. Everything: such large questions as, "What is this planet?" That film also received a prize at the student festival. In this country it was very unusual, and still is, for a student filmmaker to be able to make a 35mm film. At the time it was normal for us, but I do not know what changes have occurred since, though as far as I know students still work in 35mm. We saw The Beginning last night and if I understand it correctly, the title has several layers of implication. It refers to the beginning of social movements, and to the beginning of a new kind of film history where montage becomes important, and to the beginning of your film career. It is my beginning, and the beginning of our modern history—a beginning that has no end and that ends with a new beginning. One could say that in society there is always continuous revolution of one kind or another. But in this instance, I was referring specifically to the October Revolution. In various instances I incorporated other processes of liberation. Of course, everyone has his own beginnings. The Beginning is about social revolution, but it is also, I assume, your declaration of independence from the history of montage editing. I didn't realize it at the time, but in that film I was already developing the principles that I was later to call "distance montage," the theoretical explanation that I understood and started to write about after the film We. Those principles were inherent from the very beginning, though I was only able to completely recognize them later. The Beginning is more like Vertov and Eisenstein than your other films, and yet very different. Superficially, on the surface, it's similar, yes. But in the way that everything is organized, it is very different. In fact this film led some people to believe that my principles were the same as theirs when in fact they weren't. When I began to explain the difference between my style and theirs, the term "distance montage" was born. None of them did what I do. There's a very unusual technique used in The Beginning. We see what is essentially a still photograph, which then goes into motion. That gesture is done over and over during an early passage of the film. It's almost like looking at the beginning of cinema. I was thinking of my own visual language. I was making an analogy to the way a train starts, gets going, and then stops. The film has its start, slowly it stops and starts, and then eventually the motion is continuous, like a train's. When you made The Beginning, which is almost entirely archival footage, were you inventing that form so far as you knew or did you know of other films made entirely of archival footage? It's mostly archival footage. There is a little bit of my own footage. I used archival footage because it has the impact of fact. But did you know of earlier filmmakers who had worked with archival footage? No. I came to the idea myself. People had used archival material, but not in the way I used it. The people at the institute were very shocked, surprised that I had actually used the footage that was available there. It wasn't the thing to do. Furthermore, to try to tell, in 10 minutes, 50 years of our history was already a risk, and a first in our film history. There was a version of We that you apparently finished. Then it was shortened. Why was it changed? And by whom? Are there different versions? I was asked to shorten it. If you were told to do something, was it required that you do it? Were they asking or demanding? Nobody forced me to do anything. There were episodes in the first version that just didn't work. Were those episodes a problem politically or artistically? Perhaps both. I don't know. For me it was an artistic problem; for them, perhaps, it was political. I know they were fabulous episodes, but I don't feel I lost anything by cutting them because even in the shorter version, the film expressed what I wanted to say. The editing expresses me. Once you took out a particular episode, did you reconstruct the film? Yes. I had to rearrange the entire structure. Because of my method of distance montage, when you take something out, you have to reorganize. If you change one element, you've changed everything. A question about the title. I assume you are referring to Armenians in particular, but also to everyone, and that the idea is that if you get to the heart of what is most particular about a people, you get to the part of them that unites them with all people. Yes. The Armenians are simply an opportunity that allows me to talk about the whole world, about human characteristics, human nature. One may wish also to see Armenia and the Armenian in that film. But I have never talked about a specific nationality. I would never have allowed myself to do it then, and would not now. If I had meant only the Armenian people, I would not have had the guts to call it We. The Armenian people are a "we" that is just a piece of the larger "We." The form of the film suggests the same thing because we look at separate details but come up with a general response. Yes. Every specific element, every frame, has the genetic code of the whole film. There are no accidental shots or frames. Every particular element has been thought out and is representative of the whole. How long does it take from the time you have footage for a film until you are finished editing? I started We in May and by November the long version had been finished. And because they asked me to shorten it, I lost another half-year in editing. Do you work full-time on the editing? During that film I don't remember sleeping. I stayed at the studio and worked when no one was there. I'm doubtful I could do the same now; I was young then. By professionals, by my instructors, at festivals. People in the field knew about it, but it wasn't screened much. Right after the film I received my diploma from the institute. Many people liked it, but at the same time, they were doubtful about it because it was so unusual. All your films are about people and the environment, but Obitateli [The Inhabitants, 1970] and The Seasons seem particularly focused on that issue. What led you to make The Inhabitants, your film about animal life? Many people were offended or insulted by We. After that experience, I was mad at mankind and decided to make a film about animals. Animals don't get upset, but at the same time, by focusing on them, I could say the same things as I was saying about people. Am I correct that both We and The Inhabitants are partially archival footage and partially shot by you? There is very little archival footage in The Inhabitants. You are one of the very few filmmakers I have ever seen who uses the whole screen. Often you cover the entire screen with a particular kind of design. I'm always very aware of composition. It's a very important component of putting the whole film together. There shouldn't be any extra compositional elements. Compositions should be detailed, specific—like soldering, or like the things a jeweler does with pieces of jewelry. The images had to be very full, but very carefully composed, without anything superfluous. I assume the title of The Seasons, like We, has multileveled implications. It can mean the seasons of the year, but also the seasons of life: youth, middle age. I assume that since you were getting toward middle age, you were becoming more conscious of the whole life cycle. Again, I was thinking of everything. It's not specifically the seasons of the year or of people: it's everything. One should not forget that this film's main "heroes" are not the people, but the seasons and nature. It is not man who imposes himself upon nature, but rather nature that imposes itself upon man. The film is about the interrelationship between man and nature. Do you think of your films as, to some extent, a map of your own personal experience, as gauges of where you are in your life during certain periods? Automatically, they probably are, yes. I don't specifically want to talk about myself, but inevitably it happens. You mentioned last night that in your process of constructing a film you begin at both ends and work towards the middle. Do you always do that? Yes. Even if I don't set up a beginning and an end, when I do the beginning I have the end in mind. I always begin thinking of the ends, and I slowly build into the center from both ends. Do you always wait until you have all the visuals and all the sounds before you begin to edit? It'd be best if I had everything; it'd be the ideal. Ideally, all the details, all the aspects, both sound and picture—everything should be in my pocket. Then if I do have to make changes, they're very small. If I don't like what I have when I start editing, if it doesn't work the way I'd ideally like it to, then I look for other things. To create the sound for The Inhabitants, I put together 30 different tracks. The sound seems as fully layered and montaged as the imagery. Even more than the image. A lot more. At times, the sound takes on the role of the picture. The picture takes up space; the sound works but takes up no space. You mean the sound is an environment within which the image is a graphic space. Yes. In my films the image can take the place of the sound, and the sound can take the place of the image. You use many different techniques in every film, but in The Seasons in particular, you do a mirror-printing. Is that because you want to emphasize the verticality of the mountain region that's the focus of the film? It's the verticality of the film I'm most interested in, not the verticality of the mountains. It's a symmetrical film. Mirror printing gives the film a center. If the viewer should incline in one direction, the mirror image then balances from the other direction. The film creates a center of gravity for the viewer. If you build an architectural tower, it always has a center of gravity. Any skyscraper in New York has a center of gravity; that's what keeps it from falling. Don't you think that it's particularly appropriate in this film since gravity is so central for these people? 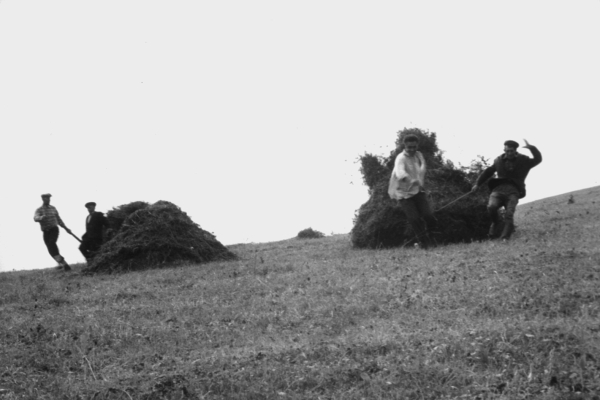 There's a scene where the mountain people use gravity to pull the haystacks down the mountainside. Yes. Their duty is not only to drag the hay down but to stop it before it goes too fast. But that principle is not specific to this film. It is in all my other films. It only happens that one notices it more in The Seasons. More and more as we talk, I realize that all your films are simultaneously about people and also about film itself. And what you're saying about people is, on another level, what you're saying about film. For instance, in The Seasons we see, over and over, the shoot of the man and the sheep going down rapids in a river. On one level, the shot reveals something about life in Armenia, but it also seems a comment on the editing process itself, which produces "rapids" in the "stream" of the filmstrip. Yes and no. For this very reason I was doubtful about this interview, because we need very specific, technical, vocabulary, terminology, to be able to really get into the films. It's hard to talk about them in plain language. For me, distance montage opens up the mysteries of the movement of the universe. I can feel how everything is made and put together; I can sense its rhythmic movement. I believe that the solar system is based on the same principles as distance montage. I'm convinced about this. I hope I don't sound pompous, but that's what I think. We all know time. It's like a bacteria and it's killing us. I feel that my distance montage destroys this bacteria and approaches absolute time. Which is clearly the subject of Our Age. The first time I saw Our Age—it was the long version—I was overwhelmed. Last night the shorter version created the same experience: I realized that the film affects me because in a sense it's about me. One of the central motifs is the rhythm of the 10, 9, 8, 7, 6, 5, 4, 3, 2, 1 countdown that leads up to the launch of the rockets. Often, this rhythm dissolves into the sound of a heartbeat. I assume one implication is that the pressure of our personal time running out as "our age," our physical age in years, increases, leads us to "launch" projects that may seem beyond us. As our time runs out, we want to transcend "our age"; and the nature of "our age" is determined by the kinds of transcendent "launches" we tend to instigate. Yes, we want to go to absolute time. At first, I wanted to give this film a different name—a name that would suggest a foreign or strange territory where there is no time. But finally I decided to give it a title that is about us, about me. It's about what I'm striving for, what we're all striving for—every person, humanity. But the wishes and desires of the people to ascend, to transcend, are literally carried out by the astronauts. That's the role they play in society. Why are there two versions of the film? I don't know why. I just wanted to have two versions. Last night you were talking about distance montage and how, after a certain point, the spectator hears things that aren't there. I know what you mean: I hear that heartbeat and the time counting down throughout the film, even when it's not actually on the soundtrack. And sometimes I can't tell whether I am really hearing it or remembering it, imagining it. Yes. The power of distance montage is that even if something that's part of the whole isn't there at a particular moment, you feel its breath. Distance montage is capable of making what is absent present. How much of the footage in Our Age is archival? I shot most of it. The shots of American astronauts are archival, but I shot all the material of the Russian cosmonauts. I became very close friends with the cosmonauts. They liked me very much, and they liked the film very much also. For some reason they believed in me, and I know that Our Age is their favorite film about them. It accurately portrays the cardiogram of their lives. The Seasons was made in 1975 and the first version of Our Age was finished in 1982. That's a seven-year break. Were you working on other people's films during that period? Film is difficult to make. There are so many things involved. You get this idea and, if you want to make a film about astronauts, you have to develop a plan, you have to organize what you're doing. Filmmaking takes so long because there are inherent problems that go along with it, especially with what I do. Some animals give birth every nine months and others give birth every seven years. I happen to be of the second sort. Maybe you're getting to be a larger animal as you grow older. It's fate. I prefer to make fewer products but to make them better. In the United States people who make films that are formally ingenious, "experimental," are often considered a little crazy or at least impractical and "elitist," not only by audiences but by other filmmakers. Is the filmmaking community in the Soviet Union supportive of your work? Yes, they have always defended me. I don't know about America, but in our country, nobody has ever considered an experimental filmmaker "crazy." Two films: one is called Konets [The End], the other, Zhizn [Life]. The End is about death? No. This film too is about life. It is about man, time, what is eternal and what is temporary; it is about change. Before we finish, I want to try to be a little clearer about distance montage. Distance montage and the effects that it creates evolve like a sphere. It's not linear, it's spherical. It's in continuous motion. If I find the system, if I construct it correctly, it will go, it evolves, and two processes will occur: you will go from the beginning of the film to the end and there will be a mirror effect; you will also go the other way. Central elements may never meet each other; they run parallel to each other, always looking for each other, but they never meet. But they exist together constantly, independently. They love each other and they look for each other, but they can never be together. They are always striving toward each other, but the territory changes constantly. D.W. Griffith increased the pace of editing to excite and engage the viewer. In the Soviet Union in the '20s, montage became a way of emphasizing Marxist ideology: a montage like the Odessa Steps sequence in Potemkin could become a central metaphor for the ideology in the film. You've gone further. You've elevated montage into a complete film. It's not in a film, it is the film. In Eisenstein there is story, a montage, a montage, story, a montage. A Peleshian film is montage. Eisenstein's montage was linear, like a chain. Distance montage creates a magnetic field around the film. It's like when a light is turned on and light is generated around the lamp. In distance montage when the two ends are excited, the whole thing glows. Sometimes I don't call my method "montage." I'm involved in a process of creating unity. In a sense I've eliminated montage: by creating the film through montage, I have destroyed montage. In the totality, in the wholeness of one of my films, there is no montage, no collision, so as a result montage has been destroyed. In Eisenstein every element means something. For me the individual fragments don't mean anything anymore. Only the whole film has the meaning. Distance montage allows you to defeat time. Take The Beginning and The Inhabitants, for example. Both films are 10 minutes. To see The Beginning you have to watch 10 minutes from the beginning to the end, so you've lost 10 minutes. But in distance montage when you reach the end, you're also back at the beginning. That which would have taken 20 minutes, you have done in 10. The experience develops spherically and the speed was twice what it seemed. This is very important for distance montage. You go from this point to that in 10 minutes, but at the same time, you're going from that point back to this without losing a moment. And the effect is that the film revolves; it is "revolution" in a new sense. This is a primitive explanation. In fact, distance montage is much more complicated. Orbits are created. Sound and image cross each other, intersect each other, switch, change territories. The sound enters the territory of the picture and the image enters the territory of the sound. You start to see the sound, and you hear the picture. Physically, a particular image or sound may no longer be perceived, but because of your memory and distance montage, it is still there. It's like water boiling in a kettle: you see that the water boils and turns into steam, and you feel the warmth on your body; you no longer see the water, but you feel its presence. The same thing happens with the picture; it boils, boils, boils until it turns into steam. If we're being clever with our metaphors, I would want to say that whereas Eisenstein saw editing as a means to get from here to there, I see editing as a means for seeing where we are. In other words, with Eisenstein there are two bodies with only one head, whereas with me there is only one body that has two heads, very far from one another, and looking in opposite directions. Thank you for your patience with my questions. I've tried to simplify things to get ideas across. But my films are precisely not about language, about verbal communications. The difficulty is that one cannot express with words what one finds in my films. If it were possible to say it with words, the films would be useless. Words cannot express it. One should not talk about films, one should watch them. This is why I have always been against interviews.